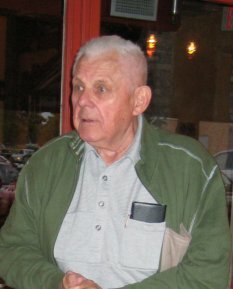 Ralph Gracza, often addressed as Rudi Bacsi (Uncle Rudi), is one of those of us for whom a short biography is not easily written. 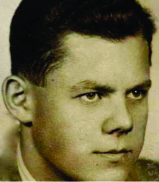 Ralph was born Rezsõ Miklós Gracza to Karoly, a mechanical engineer, and Zsuzsanna Grazca on June 7, 1921 in Budapest. Rudi bácsi kilencven! Vajon mit forgat a fejében? Könyvet ir, vagy főzeléket kavar, Nótázik vagy verset szaval? Irigyli bizony minden gyerek, mikor a medencébe ugrik fejest. Ohioba hajt, vagy levelezik az elnökkel, Ha nem, akkor perel a computerrel! Tűzet rak vagy vendégeit fényképezi, Vigyáz, hogy üres kézzel ne távozzon senki. Madarat etet és képet keretez, Sosem tudhatod hol leled meg. Hamarosan a rendőrség körözi Őkelmét! Jobban teszed ha bejelentkezel előre, mert ki tudja hogy mit tervez Rudi bácsi a következő kilencvenre! What could he be thinking of doing next? Writing a book or stirring up some good soup? Singing a song or reciting a poem? When he dives into the swimming pool,. Is he driving to Ohio or corresponding with the president? If not, he is arguing with the computer. Have you heard that he is the famous Chives Hunter? The Policemen will bring him home. Who knows what he plans for the next ninety years!